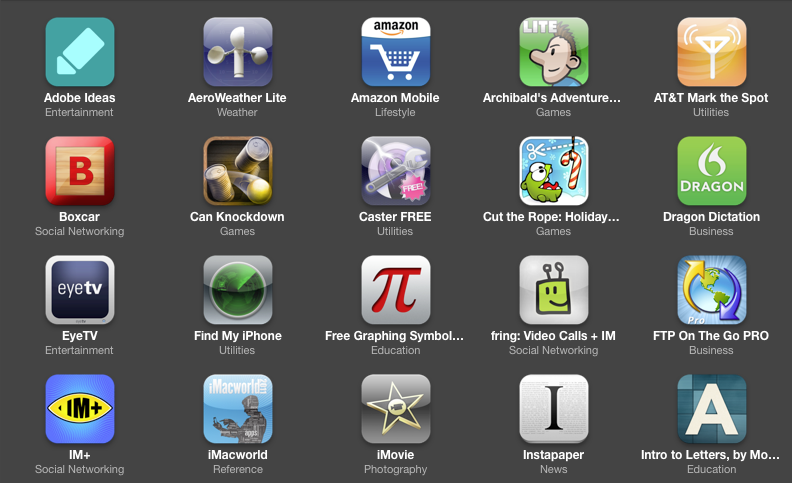 A friend of mine, Brennan McCurdy recently asked what must have apps I would recommend, since he just got an iPad 2 as a gift. 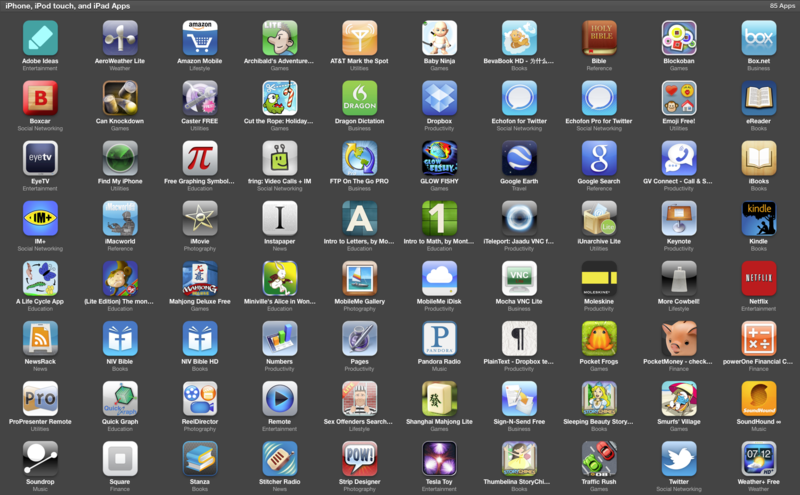 My first thought was to update my profile on iusethis.com for those apps that I actually have installed and use. 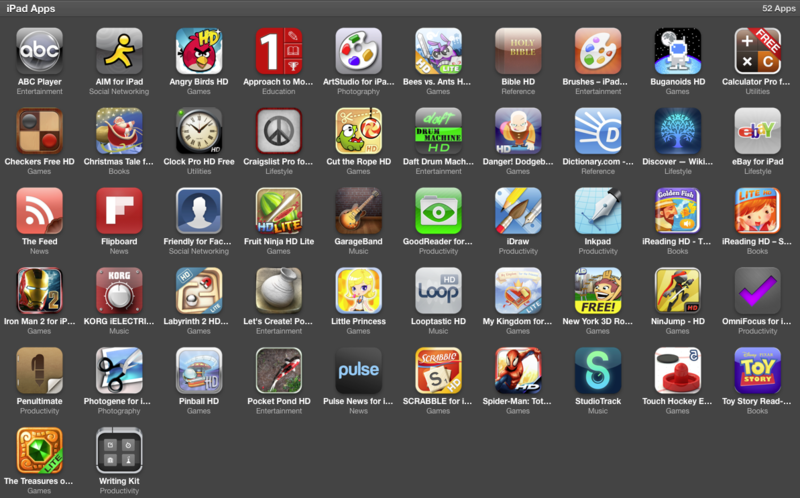 Sadly, iusethis.com does not have an easy way to scan and add iPad apps to my profile. They don’t even have an iPad section at all. 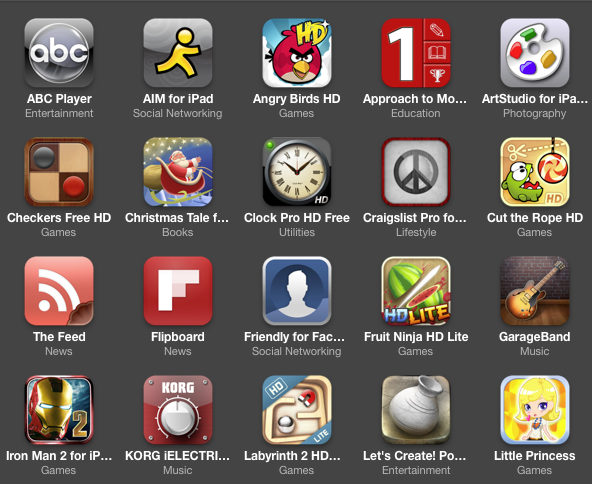 So I opened iTunes and took a few screen shots of the apps I and my family have installed to date. I will start with universal apps, since they are the most convenient. These are roughly in alphabetical order. 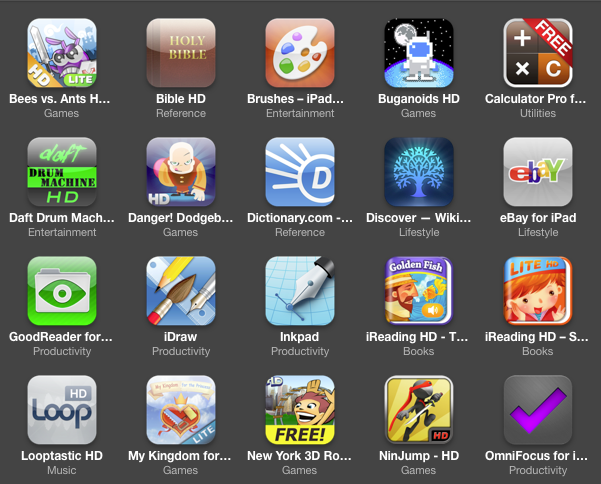 You may notice many apps are free games installed by my wife for the kids that use her older iPad which has become a greasy child-fingerprinted game console, an educational tool and a cartoon-watching powerhouse. 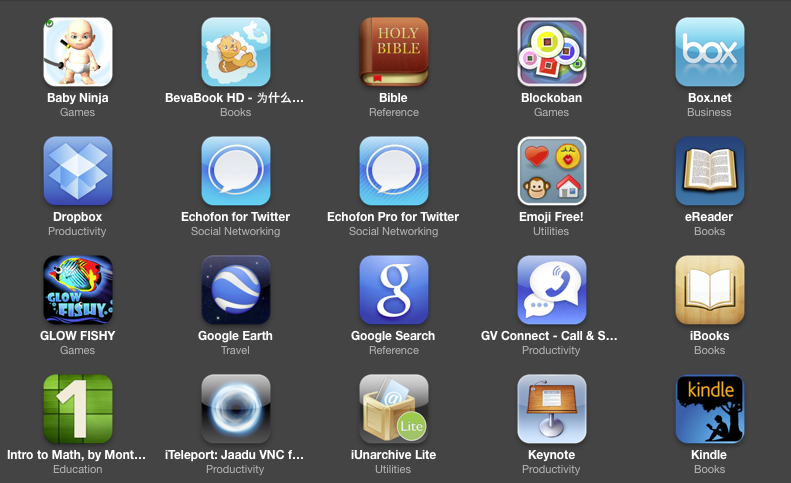 I will talk mostly about the ones I have installed on my iPad. This is free and is useful for creating color swatches from photos taken from the iPad camera or from your photo library for design projects and doodling in a vector based exportable format. Great to search for items to buy from Amazon.com and for general pricing research. If you have an ATT 3G iPad, you can use this app to report weak signal areas and make your neighborhood a priority for future service upgrades. This app is a helper app that enables push notifications for other apps. A fun alternate way to enter text with your voice to be used to start an email, tweet, Facebook post or text message. Essential way to track down a misplaced or stolen iOS device like an iPhone or iPad. Also useful to monitor the travel progress of other family members. Great tool for web developers to edit and upload files on an FTP server. I have published some basic web sites entirely from my iPad. See my basic site. Fun way to record video, edit it and publish immediately while on the go. Works great for making slideshows too from still in your photo library with audio from iTunes. A great way to read articles sent to your Instapaper account from cluttered sites that would be too time consuming to read online. Synch online, read offline. I installed this because a client used it, but found the notification of when files were accessed useful in dealing with Design clients. An essential service for storing and keeping files up to date between devices. The app allows some offline access to synched favorite files also. Installed only to unlock emoji icons, a texting feature added by Apple to add feature parity with popular Japanese cell phones. Many iOS users add this to make tweets festive, even though invisible to computers and other mobile devices. An app interface for Google Voice, optimized for the iPad’s large display. Very useful to comfortably text two handed with others. Requires Boxcar for quick notifications while the app is closed. Apple’s own Reader for ePub documents and PDf files, which includes a book store. One of my favorite tools to access and control my home computer remotely. Useful even while at home. Acts like a remote control if you use your mac as a media console for movies and music too. Build presentations with sophisticated animations and present on site with the iPad to VGA connector. Read and download purchased books from Amazon’s kindle store, a much larger repository of eBooks than Apple’s iBookstore. View and share images published to your MobileMe Gallery and access shared galleries from friends that use MobileMe. My RSS reader until I purchase Reeder, which I hear is highly recommended. 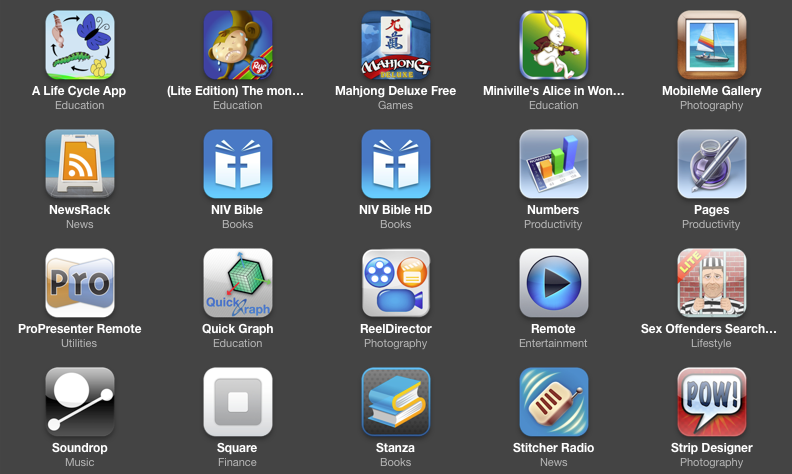 My favorite app for searching, reading and sharing text from the NIV Bible. I bought the iPhone version, then the iPad version, and then they updated both versions to be universal, which annoyed me, but it is still a great value, especially if you don’t want to read a slow-loading online Bible. Great for editing and creating spreadsheets and importing and exporting Excel files sent by mail. Create professional documents and send them as PDFs complete with text styles and image layout. I make invoices with it, mostly. Useful to control a computer running Pro Presenter 4, maybe earlier versions too. sometimes I would hand it to my son to advance live song slides while I made last-minute edits to other presentation slides. Control iTunes on your home network. Adjust volume and playback on music and movies. Accept Debit and Credit Card payments from customers with the free Square Reader headphone attachment. Access files on your iDisk, assuming you have a paid MobileMe account. Stream music that Pandora thinks you will like. And listen to occasional short ads. A clean well designed text editor for plain-text files. Synchs with a folder on your DropBox account too. Better than the notes app. An iPad sized calculator with powerful free downloadable functions to calculate fancy things like mortgage payments and interest rates on loans. A free app that lets me take an emailed PDF form and fill it out, add my signature to it, then email it back. Listens to music playing, then tells you about the artist and title of the song, along with a few links to buy the track. A solid app to tweet and read your friend’s timelines with. Find the weather forecast for one city at a time. Send and receive instant messages with anyone still using this. Supports push notifications too. Very quick and responsive. A great big clock, nice looking too. Search craigslist.org and list items with photos right from your iPad. Way better than the regular site, optimized for the touch screen. Browse News and Articles by topic. Unique interface. Almost as reliable as the Facebook site. Free. Allows you to upload photos too. Create eight track audio and play with smart instruments. send audio files by email or send them to a Mac for further editing. The most responsive painting app for digital artists. Great interface to the encyclopedic amount information on wikipedia. Browse eBay listed items, and list your own stuff too. The swiss army knife of file management. Also uncompresses zip files. The best vector illustration app available for the iPad, from Steve Sprang, the creator of Brushes. Plain text and markdown editor that supports uploading images, researching and previewing written documents, as well as html export for stunning email, blogposts, and the web. A game that is fun for people who like words. Feel free to ask me about any of these apps. There are a few essential iPhone apps that I use in my iPad, and wish the developers would make an iPad version or universal version of, because it is not my preference to tap on the iPhone optimized keyboard, but it will have to do for now. 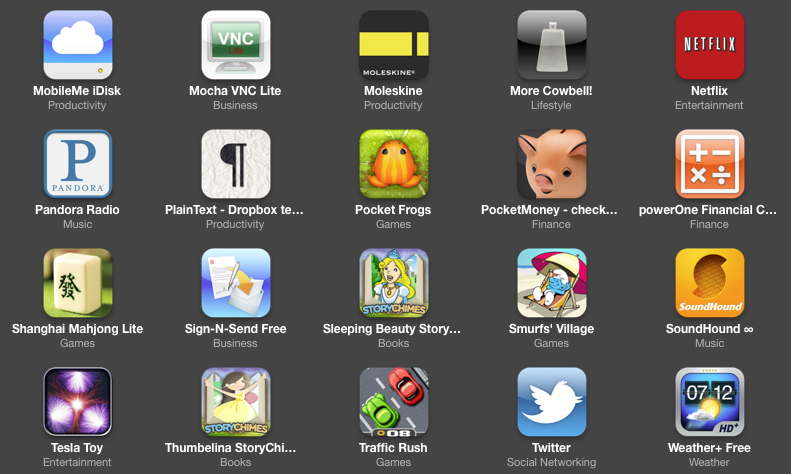 One example of this is the app, Moneywell for iPhone, which has a great mac companion app it synchs with. I use it to manage budgets and all of the financial details of my business and family. * A Universal app is one that is designed to work on both the iPhone and iPad. Note: The stuff below this line is an ad. My post actually ends here. This entry was posted in Software and tagged AppStore, best solutions, iOS, iPad apps, reference, software on 2011-07-08 by ezraengle.